So I bought all these really gorgeous mini heirloom tomatoes on sale about a week ago – and I failed to use most of them within a week. I hate when food goes to waste, but I hate it even more when good food goes to waste. I didn't know how much more time the tomatoes had – tomatoes seem to be like milk when it comes to determining the mystery of their spoilage. Not easy. So I decided to avoid dealing with guesstures and eventual disappointment and decided that I would make a tomato pie. Don't ask why. I've never had one. I've never even heard of one. But it sounded rustic and delicious and I figured it had to be something people made. So I took those tomatoes and I stuck them all in a pot over medium heat. I drizzled a few generous tablespoons of extra virgin olive oil, and some good balsamic vinegar, sea salt, black pepper, and a whole bunch of chopped fresh basil, rosemary and sage (didn't want those to go bad either). I let the tomatoes get awfully happy over the next 15 minutes until the skins were peeling off and the tomatoes were swelled and ready to burst. And what did I do now? I helped them out. With the back of a spatula, I “bursted” those tomatoes so that all of the delicious stewed liquid inside could come out and richen the tomato compote. At this point I wanted the mixture to thicken and reduce, so I turned the heat up high until it was bubbling, and let the excess water cook away. As it reduced by about half, it gradually thickened, but I wanted to help it along even more, so I added several tablespoons of whole wheat flour and mixed it in vigorously. This helped thicken the mixture more, so that it would stand up as a pie filling. I took the mixture off the heat and tasted it to know that it needed slightly more salt and pepper. I had already pressed a thawed pie crust into a glass pie dish, so all I had to do was scoop every last bit of heirloom tomato, balsamic, herb-filled goodness into the crust. I then layered about six slices of provolone cheese over the top and then pressed the other part of my pie crust over the top and pressed it together with the bottom crust to create a seal. 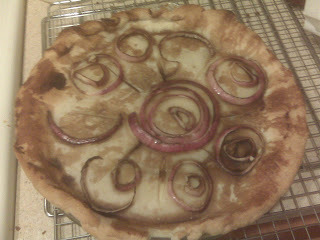 Finally I brushed the entire top with balsamic vinegar, made six slits with my knife and then put some thinly sliced red onion on top for a little focaccia-like flavor and decoration. I put the pie in the oven for 16 minutes at 425 degrees and this was the perfect amount of time. The crust was golden and crispy but not burned anywhere. I let the pie cool for a few minutes and then sliced it and served it. It was a little hard to slice and was ever-so-slightly oozy, but what it lacked in finesse it easily made up for with mouth-popping flavor. Flavor-rich, gooey and savory tomato filling surrounded ever-so-delicately by the warmth and crispiness of the crust. It had a nice rustic character to it and was one that I was proud to have created. I might tweak it slightly for next time. But it was a more-than-adequate if not marvelous usage of my no-longer-wasted, now-beautifully-remembered heirloom tomatoes.